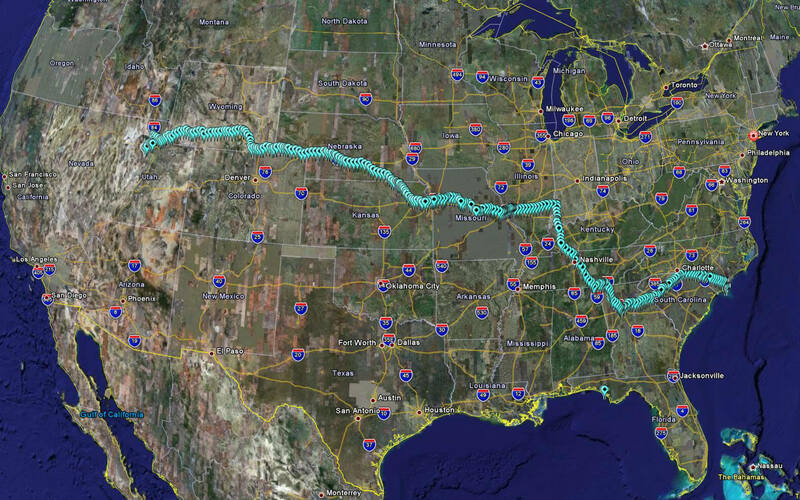 Whether operating across the United States or shipping between the U.S. and Mexico, RSAE Labs will ensure your valuable assets are safe and secure across the entire enterprise through real-time monitoring and instant reporting. Our Global Sentinel® devices and mist® Mesh Asset Tag sensors continuously monitor the position, status and security of assets to provide logistics intelligence, intrusion detection, and situational awareness across your entire rail enterprise. By incorporating both satellite and cellular communications, RSAE Labs provides total coverage, which enables alerts with exact locations or event notifications in near real-time. RSAE Labs can monitor cars on sidings and in yards and can detect railcar intrusion. We can also help you improve your bottom line by giving you the ability to know where your rail cars are and allowing you to reduce the amount of time containers and rail cars are inactive in the rail yard. From a safety perspective, our devices have the ability to send an alert from wheel bearings to the engineer quickly enough to prevent or reduce the consequences of derailing. Our rail solutions rely on sensors called Mesh Asset Tags and form our mist® network. These tags give you the ability to monitor wheel bearings (hot box), weight and balance, temperature, humidity, door state, G-force, movement, tanker car hatches and valves, and rail support equipment (vehicles, trailers, chassis, etc.). When the need arises, you can even change the business rules and reporting requirements on the devices remotely. 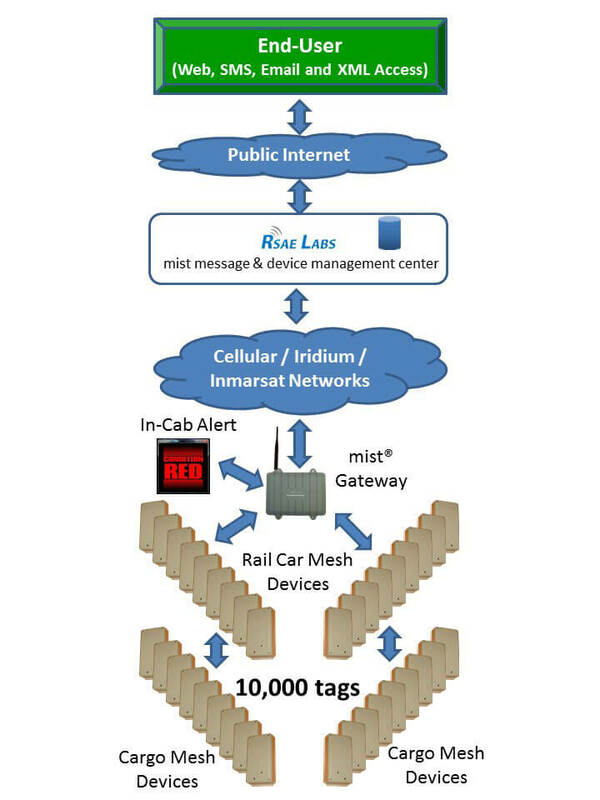 The mist® mesh protocol, which is compliant with a 802.15.4 physical layer, autonoumously creates an optimized mesh network topology allowing the tags to communicate encrypted data from tag to tag until it reaches a Fixed Mesh Gateway or Mobile Mesh Gateway. A mist® mesh network and scale to 10,000+ tags and hundreds of hops. The Global Sentinel® device serves as the Mobile Mesh Gateway and has the ability to track and monitor rail assets, too. 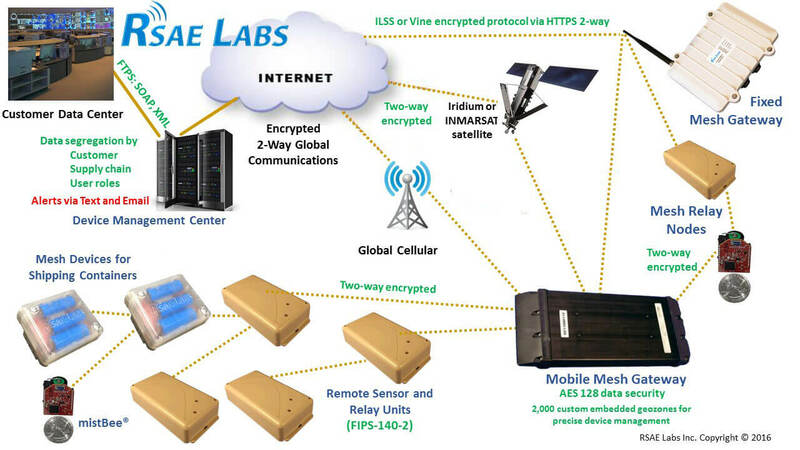 The Fixed or Mobile Mesh Gateways communicate to RSAE Labs’ Device Management Center, which acts as an intermediary between asset monitoring and tracking equipment and the customer’s back office system. 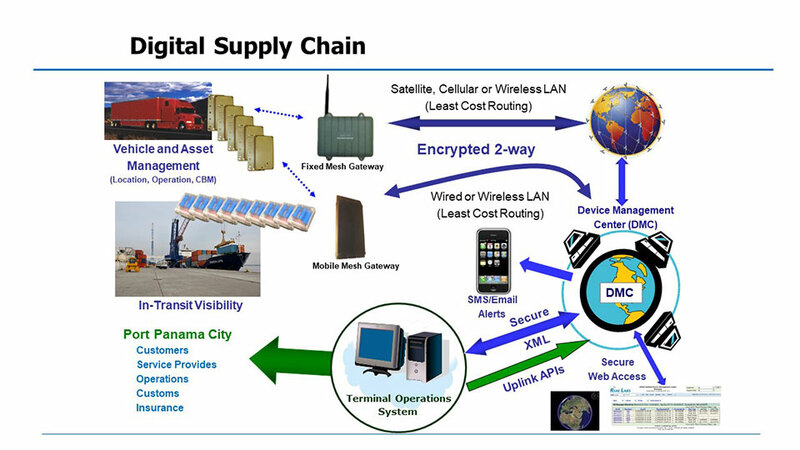 The DMC is web accessible and provides you with secure data collection, analysis and dissemination between your deployed devices and authorized users.The ultra-low power mist® mesh network technology is available for licensing and integration into sensors, detectors and other devices.